As we approach American Craft Week, Oct. 4 – 13, 2013, I begin to think about marketing craft in Kentucky and realize there are three groups that are important players in the industry — the artists, the retailers and the customers. Often times, there is a direct relationship between the artist and customer, but it is the craft retailer that reaches enough customers to make the industry sustainable. 1. Why do you sell craft? 2. What are some of your customers’ favorite Kentucky Crafted items? 3. What does being a Kentucky Crafted Retailer mean to you? 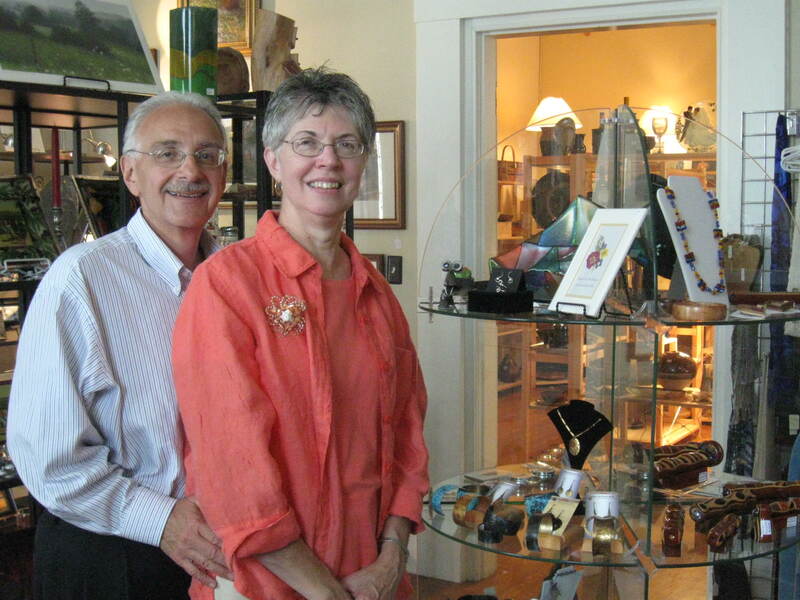 Amy and Mike Martino promote both local and national artisans at the Gift Shoppe on Main in Brookville, Ind. Whether it is a gift for you or someone else, they offer the area’s finest selection of handcrafted American-made artisan gifts including pottery, glass, copper, art, jewelry, handbags, scarves, smocking, weaving, cedar chests, mixed media, quilting, wood, baskets, gourds, candles, soap, food, Christmas ornaments and more. Here are their answers to my three big questions. 1. The love for the arts was passed down to us from family members who were quilters, seamstresses and musicians. To honor our heritage, we wanted to have an outlet where we could promote the arts to the public to make them aware of the talents that are associated with finer craft making. We are also very interested in made in America and home-based businesses. Our gallery has made it possible for us to currently support more than 100 American artisans, most of which have a home-based business. 2. Customers’ favorite artisans are Nora Swanson Jewelry, Rachel Savane Jewelry, Richard Kolb Yardbirds, Luann Vermillion Wildflowers, Dan Neil Barnes Glass and Robert Ellis Woodworking. 3. Being a Kentucky Crafted Retailer gives us the ability to promote a high standard of craftsmanship that we want to offer in our gallery. 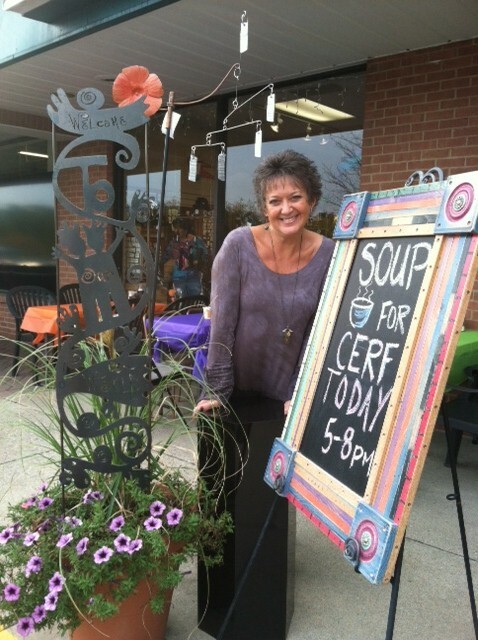 Kim Megginson and her husband started out as potters and sold work at a number of craft fairs before taking over ownership of Zig Zag Gallery near Dayton, Ohio. At Zig Zag Gallery, Kim promotes the work of small studio American artists along with Pandora jewelry, StoryPeople, Naot shoes and Fair Trade items. 1. With our backgrounds and life experiences we have had the opportunity to know and work with many artists. These individuals and their beautifully handcrafted work have brought tremendous joy to our lives. To be given the privilege of making a living working with these talented people is truly very special. Dyesigns by Pamela – Customers love the beautiful color palette of her scarves. Kentucky Springs – We have sold Kyle Ellison’s salad tongs for probably 20 years! It’s the best hostess gift ever. We always tend to gravitate to things with a little bit (or a lot) of humor. 3. While the primary focus of our gallery is the work of small studio American artists, we especially enjoy featuring regional work. Working with the Kentucky Crafted program has helped us discover more of these regional artists. I felt that becoming a Kentucky Crafted Retailer was important for a couple of reasons. I have great admiration for the support that the Kentucky Arts Council offers to Kentucky artists and hope that becoming a Kentucky Crafted Retailer helps in some small way to support this program. In addition, it creates another avenue to promote the artists working with the Kentucky Arts Council. Ann Wingrove, owner of Completely Kentucky in Frankfort, Ky., is proud to offer the work of more than 650 of Kentucky’s best artisans. She buys directly from small family businesses, many of whom follow generations of family traditions in their craft. 1. I worked as a consultant for a number of years, traveling all over the country. No matter where I was, I always looked for local art to bring back. At the same time I was also involved in downtown revitalization through the Main Street Program. I decided I should put my time and money where my mouth was and open a downtown business. Choosing to sell only fine crafts made in Kentucky made sense. I wanted to offer to other business travelers, locals and visitors what I looked for when I traveled — a wide selection of fine craft and locally made products. Having the Kentucky Crafted Program helped tremendously. Kentucky has so many talented craft artists and a tradition of creativity that makes me proud every day I walk in my store. 2. That’s difficult to answer. We offer all media and price ranges at Completely Kentucky. I think it is essential for customers to realize the range of hand-crafted work that is available, and that not everything is expensive. That said, we do have several categories that are consistently good sellers. Pottery is always popular. People love to have a handcrafted mug, or a special serving dish. Jewelry is also in great demand. As a jeweler once said, “You may use the same casserole dish for years, but a woman can never have too many earrings!” We have seen a growing demand for larger pieces, too. Furniture, sculpture and outdoor art are all strong categories for us. Functional wooden items, boxes, spoons and pens make great gifts. We keep a holiday section stocked all year as many people love to buy an ornament when they travel. 3. Kentucky Crafted Retailers have deliberately chosen to support local suppliers. That means we don’t have large profit margins (like retailers that sell imported items). We can’t purchase in bulk and we often have to wait a long time for delivery. But, we also know exactly who makes the work we sell, we know where our money goes, and we get to sell wonderful, beautiful, meaningful items to our customers. We thank each customer by telling them that every purchase directly supports more than 650 Kentucky family businesses. How cool is that? I know that Completely Kentucky is supporting our local and state economy. I know that local communities throughout the state are benefiting from the income our artists bring in. It’s a great feeling to support family businesses. Challenge yourself this holiday season to buy at least one gift from a Kentucky artist. Why? There are certainly many reasons to support your creative neighbors. Here are just a few thoughts. When you buy local, more of your money stays in your community, whether you define community as your town, your region or your state. Purchasing a product from a corporation headquartered thousands of miles away means little of your money stays in the community. Should you even care? Well, yes. Local taxes support local services, like your fire department, public library, police station and public schools. Small business owners and their employees (who are usually local people) benefit from increased revenue, increasing their purchasing power. First, check out the fantastic artists and musicians listed in the Kentucky Arts Council’s directories: Kentucky Crafted, Architectural Artist Directory and Performing Arts Directory. Visit one of the special artist events happening across Kentucky in November and December. You can find a list of activities and participating Kentucky Crafted and Architectural artists here. We’ve also put together a list of Kentucky Crafted retailers that sell a wide variety of Kentucky-made merchandise. Several retailers are hosting special events and promotions throughout the holiday season. Take a tip from Arts Marketing Director Ed Lawrence in “Double Your Pleasure” and spend a pleasant weekend afternoon meandering the countryside, stopping at a few studios and putting a face and name with a purchase. Give a gift from Kentucky: good food deserves better! Good food still deserves better! Kentucky Monthly magazine just released an online holiday gift guide featuring many Kentucky Crafted artists and retailers. I’m sure you’ll find a one-of-a-kind present that’ll knock the socks off the person you’re buying for. Feel free to post your best finds on our Facebook page . We’d love to hear from you. Happy holidays, everyone.